We recently delivered a number of bikes, in person, to people living in Tanzania. The delivery was part of our ongoing Wheels 4 Villages project. The culture here is such that many people within the community are more than happy to share their bikes. This is wonderful to see; when a person is given a bike they automatically treat it as something that others within their circle of immediate neighbors will be able to utilize also. Health or lack there of is major problem in the area; there are many widows. This is partly due to the lack of a good health service and health education is generally not available. We hope that the bikes given to the medical community will help them spread the word about how to stay safe and healthy. Another ‘problem’ is that the Moslem faith allows multiple wives. When a man’s first wife gets old, the man often marries a second time to a much younger woman. They then have children with the younger wife and when the men die they leave behind wives and young children for whom life is very tough. The family network is very tight, the parents keep their children close by, they are all very close. Sadly though, once the girls grow up and marry, it is unlikely that they will ever see their families again since they are supposed to treat their husband’s family as their only family. Here are some stories from the people we met and donated bikes to. Yosif is Moslem and has 2 wives and 4 children. They live on the side of the mountain overlooking the Nytostar Cent. He and other community members are working together to build a narrow road from this side of the mountain down to Kivisini. They are paid $1 per meter of road construction and they do this in extreme heat. A family with 3 children, they also live in the settlement that overlooks Ugweno Valley from the mountain. They farm goats and chickens and are relatively rich due to natural resources — they have a stream running through their property. They work very hard, having to travel for 3 hours to get to the market. Very friendly people, they gave us a tour of their home, which had newspaper for wallpaper, it was dark and infested with flies, but they were all very happy. Elizabeth is a school girl studying at the Ugweno Secondary School, she is an orphan and was taken in by Pastor Baraka and his family. She will use the bike to get to school for now and once her education in the mountains is finished she will use it for getting to either further education or to her job. She is the girl in traditional dress holding a ‘thank you Trent College’ in the picture. He will use the bike to get to the market and back with his goods from the mountain. He travels everyday from the mountain to Kivisini and he would use the bike to transport his water containers to his farming land. This man was homeless and an alcoholic before Pastor Baraka and his family took him in and rehabilitated him. They also lent him money to start a business and a new life. He now lives a life of sobriety and he works as a cow farmer, he slaughters his own beasts and will use the bicycle to take his meat to the market and local shops, so it will be fresher for the customers. These bicycles will be held at the Community Centre and will be there for the use of the villagers. The system has been set up so that any person can use a bike, they just sign it out and then sign it back in again in when they’re done. If we see a pattern that a certain person is regularly borrowing a bike, we will consider them for a personal bike on our next visit. The borrower will be responsible for the bike whilst they have it. We have hired a bike mechanic to look after these bikes. He has been provided with tools and spare parts, and there is a money float to purchase items needed, if and when they are needed. Villagers can come to Amenieli for him to work on the bikes and he will also tour the villages one day a week with his toolkit to do “on site” repairs. We have paid Aminieli $200 in advance wages; he will be paid $20 per month for now. As we expand our work here, it may be necessary to hire him to work more hours and perhaps, in addition, oversee other bike mechanics. Rhoda Mwaijuma is a charcoal maker; she has a child that goes to the secondary school which means that she has to board. This costs Rhoda, who is a widow, £50 per year, which is a lot of money to her. She will use the bicycle to collect the charcoal and to sell it along different road sides. Eli is a farmer, he will use his bicycle to get to his land and to transport his produce to the market. The market is an approximately 6 hour journey, the round trip. He can also carry his water containers on the bike to water the crops. The health centre has 1 doctor and 2 nurses working there. They have many daily house calls to do that stretch over a vast area. We have given the centre 2 bikes to make this easier for them. They were walking for approximately 2 to 3 hours a day on house calls, carrying an ice box to keep the necessary medicine cool in the terrible heat. With a bike they can make more house visits, and the drugs will be less likely to overheat. They can also spread the word and educate more people about prevention disease. AIDS and Malaria are big killers in this region and by educating the people, lives can be saved. This is a young woman who is a widow with a teenager at the secondary boarding school. She must also pay £50 per year to educate her child. Fatouma is a brick and charcoal maker. At present she walks a 24km round trip to Kifaro to sell her charcoal. She will use the bike to transport the charcoal, and the bricks she is making to build a new house. The house that she and her children live in at the moment is literally washing away and the thatch is in a terrible state. Another widow with a son at boarding school in Jipe, Mina will use the bike to get to work. I am not sure, but at the time of our visit, she may have been pregnant. Another charcoal maker, Jonaisia is also a widow with a child at boarding school. She can hardly afford the fees, but feels that an education is very important for her son. She will use the bike for work — to transport the charcoal — and her son will help her when he is not at school. We gave a total of 12 bicycles to the Kivisini school. Many of these children travel 2 to 3 hours a day for school and they carry water containers to fill up at the school tap. For the trip home they must lug the very heavy containers home again. The heat is intense and after walking their school route, I can fully appreciate how tough a journey this is for the children. And their days do not end with school, when they get home they then have to help out on the farms. Their lives are not easy. The bikes will of course make the school trip much quicker and easier for them, they can also carry the water containers on the bike. In fact, the very next day, I photographed a school girl carrying 4 yellow containers on her bike. Some of the children have siblings at the same school or neighbors at the same school, so this means that they can share a bike. Therefore in most cases, we gave 1 bike to share between 2 or 3 children. They will adapt the bikes with a rack on the back so that more kids can sit on the bike. We also donated a bike to the school as a whole. This can be used for the teachers to run errands and also as a back up if a child needs to go home to collect forgotten homework, or if they are sick. 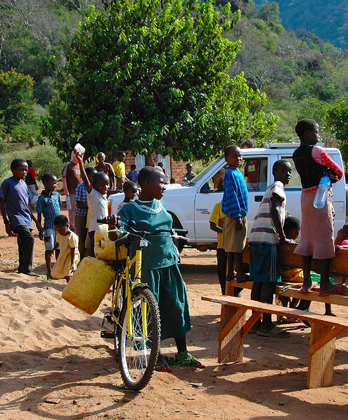 The children keep the bikes at the medical centre during the day, under a Baobab tree, where they are safe. This nurse named Navone is the acting Daktari (Daktari is doctor in Swahili) since the qualified doctor is away for 3 years. She speaks some English and she has to travel around a large area to treat her patients. She makes many pre- and post-natal visits and administers vaccinations. We filmed Joise in her home whilst the nurse Navone was doing a house call. Joise is disabled, so her family will use the bike to transport her and also for work, to help support Joise since she cannot work. Sadiki is 78 years old with a very young son. A farmer and a fisherman, Sadiki will use the bike to get to the lake and to his land. He will also use it to get to the market which is a 2 hour walk from Jipe. His fish will hopefully be much fresher and he will be able to sell more of it by using the bike. Iddi is a farmer who cannot walk very far anymore, but he is able to ride a bike. He will use the bike to get to his farmland, which is 2 hours away on foot. Also his family will use the bike to go to the market. Mwanini is a widow and earns a living selling bananas at the market. She travels for 3 hours to the market with her bananas on her head. The bike will make the journey quicker and of course easier since she no longer needs to carry the bananas herself. Mustafa is a fisherman who walks 3 hours to get to the market and 3 hours back again. Many times the fish are spoiled by the time he gets there. He earns $5000 a month and he has a wife and a young child to support on the equivalent of $5. This is a 15 year old boy at his last year of secondary School. He will use his bike to get to school for now and then he will either use it to get to further education or to his job. Salimini has a 4 hour round trip to school and back each day in heat up to 120f he will be a great example of someone to follow through his next few years and see how a bicycle will affect is life. A very proud woman, a widow with a child at elementary school, Eliukunda works extremely hard to grow crops on a difficult plot of land. She will use the bike to get to the market with her crops, 6 hours round trip, and also to go to church. She wants to rebuild her house, so she will use the bike to transport mud bricks and water as well. Another very proud woman who is severely disabled — her feet are twisted and withered and she must be carried everywhere. Her grandson rented bicycles when he needed to take her to the doctors or on errands, or when he had to transport their food and water. We have given her family a bike so that they no longer have to rent them, which they can’t afford to do. She was very happy for me to photograph her, very insistent, she wanted to pose me for, quite a character. She would be a good follow up recipient. These are 2 schools on the same campus; the campus is split down the middle diagonally. The children are from 2 separate areas, but they are the same ages. We have given the bikes to the school and the school will give them to a child to use at their own discretion, i.e. whomever they think will most benefit from its use at any given time. The bikes are for the children, however, if a teacher needs to run errands while the children are in school, they can borrow the bike. The bikes will always stay the property of the school; when a child leaves school the at the end of their education, the bike will remain.